Shape Collage is a free automatic photo collage maker that lets you create picture collages in less than a minute with just a few mouse clicks. Shape Collage is a free automatic photo collage maker that lets you create picture collages in less than a minute with just a few mouse clicks. Shape Collage creates collages using an intelligent machine learning algorithm that automatically places the photos in the collage and can arrange the photos to form different shapes. 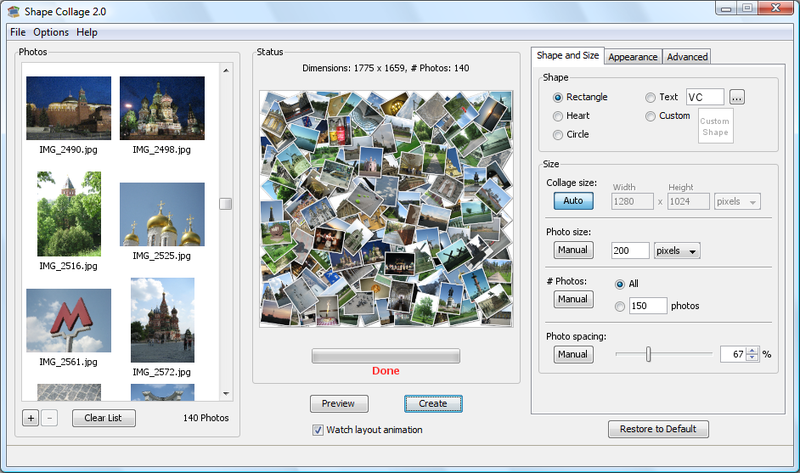 You can even save the collage as an Adobe Photoshop PSD file and edit the collage afterwards in Photoshop or GIMP.